Maybe check with your coders or optometrist. 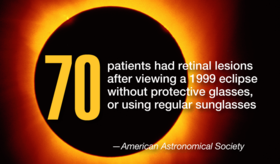 H31.023 is the ICD-10 code for solar retinopathy, or injury to the retinal tissue that typically comes from sun-gazing or, um, viewing an eclipse without the right protection. Knowing the code may come in handy this week. Download the PDF.